Another new Gretsch designed to deliver at high volume without compromising on character… does this compact and flamey semi sound as good as it looks? 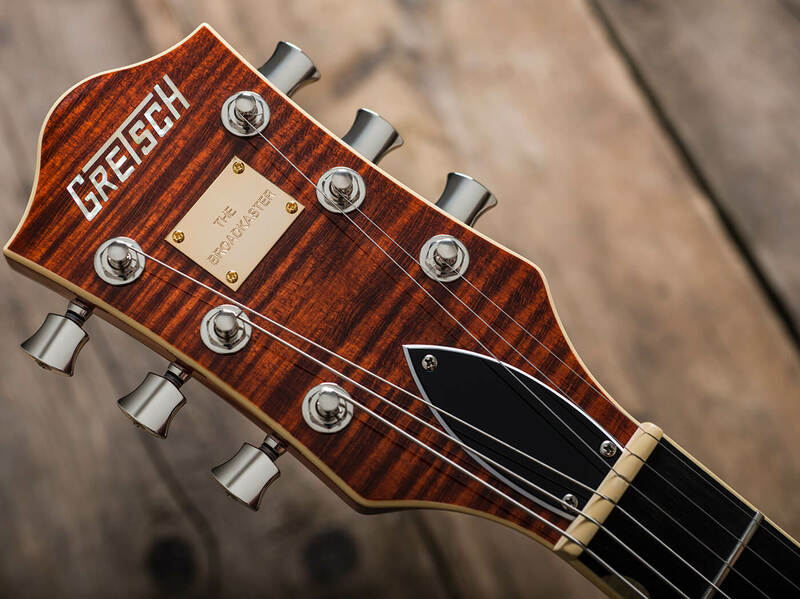 For many years, if you wanted a slice of the Gretsch sound and aesthetic, then your options were limited to large, full-hollow archtops or compact single- or double-cut Jets. Happily, in recent years the company has provided a variety of ‘best of both worlds’ solutions in the form of scaled-down Jr models and guitars equipped with feedback reducing, and sustain enhancing, centre-blocks. Part of the Players Edition range designed with the modern working professional in mind, the G6659TFM Broadkaster Jr’s 14-inch body has a slim, 335-like depth of 44mm and is built around a spruce centre-block that runs its entire length. Spruce is a light wood, so it’s able to provide extra sustain and feedback resistance without making the guitar restrictively heavy. 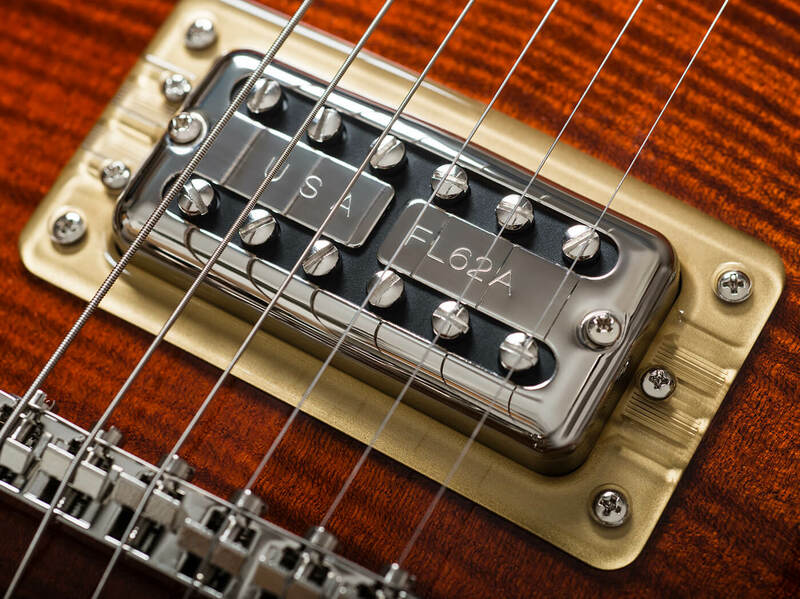 The centre-block also provides a firm foundation for the B7CP String-Thru Bigsby, while the Adjusto-Matic bridge sits on threaded posts that are screwed into the body. 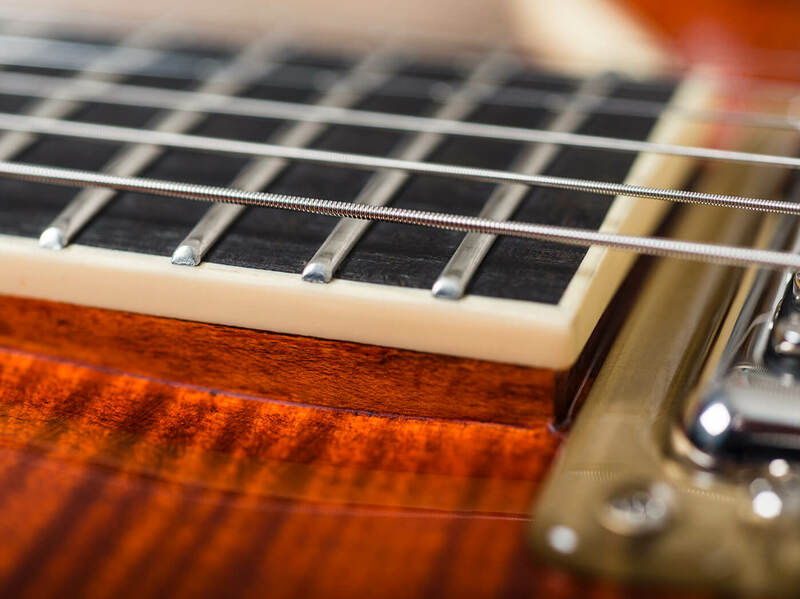 This Gibson-style bridge-mounting method may break with Gretsch tradition, but it’s coupled to the body more effectively and it will stay put regardless of how hard you play. When it comes to electronics, here we have another variation on Gretsch’s deceptively simple and practical approach to guitar controls. In a sense, it’s back to the Dynasonic era of the 1950s, as there’s no ‘mud’ switch – the Broadkaster Jr has a master volume on the cutaway horn and a single three-way toggle pickup selector. 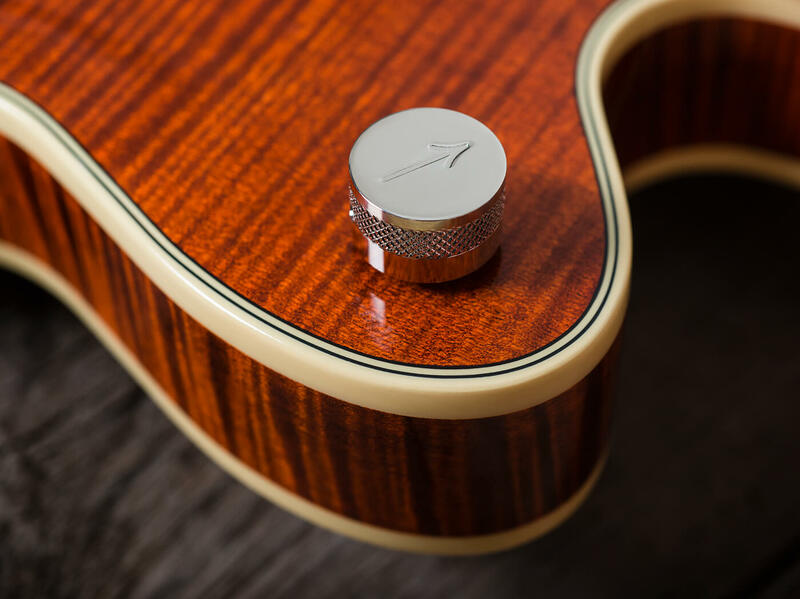 The other knobs comprise individual pickup volume controls and a master no-load tone control. With the tone control set wide open, the signal bypasses both pot and capacitor, but knocked back from the notched position, it behaves like a standard control. On compact bodies such as this, Bigsby vibratos can restrict access to controls, so the easy-access master-volume placement is one of Gretsch’s finest ideas. But if preferred, you can simply ignore it and use the individual volume controls instead. Again, Gretsch has turned to Fender’s in-house pickup guru Tim Shaw. Earlier in his career, Shaw reverse engineered vintage PAFs for Gibson with highly impressive results, and he’s recently been heavily involved with the R&D on several high-profile Fender launches. We were impressed with Shaw’s Broad’Tron pickups on the Players Edition Jet, so we’re naturally keen to try his Full’Tron humbucker design on this guitar. According to Gretsch, Full’Trons slot in between Filter’Trons and Broad’Trons in output level, with more midrange and growl than the former and a touch more definition than the latter. Here, they’re set quite deep in the body, because Jr models have a shallower neck angle than vintage Gretsch archtops. 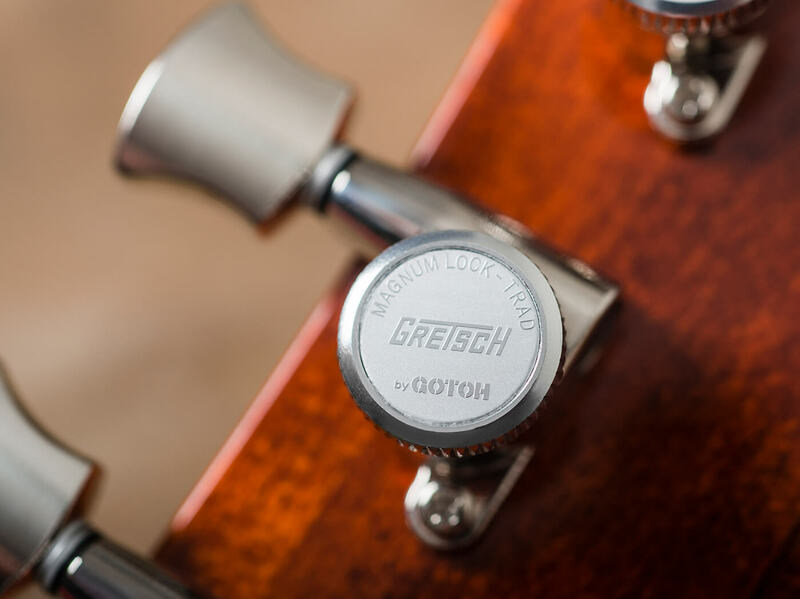 Gotoh locking tuners provide another modern twist and the keys look similar to the Sperzels favoured by Brian Setzer. 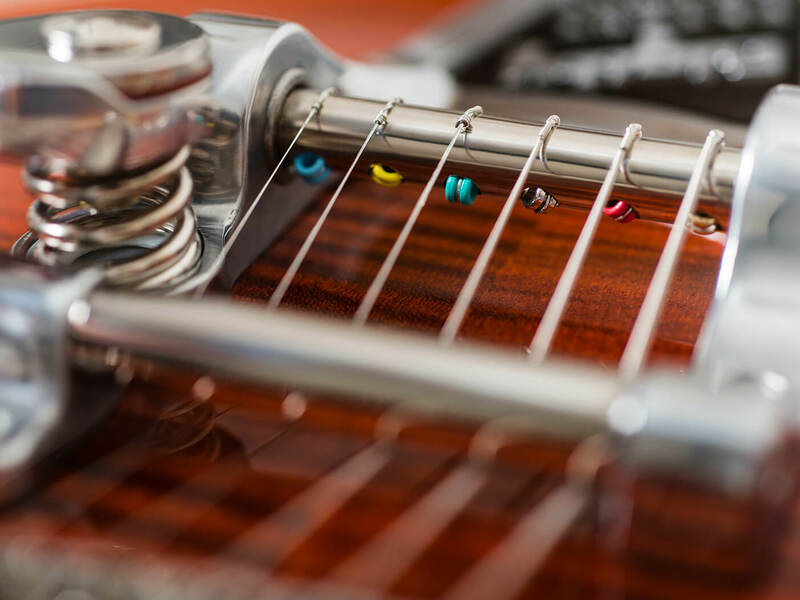 Besides quick string changes, locking tuners are also supposed to improve tuning stability for vibrato-equipped guitars – so long as the string wraps don’t exceed a single turn around the tuner posts when they’re at concert pitch. Gretsch made orange iconic with the 6120. The shade varied throughout the 50s and 60s, and many of the earlier Dynasonic-loaded examples with the Western trimmings have a darker, burnt amber look. If it was Gretsch’s intention to replicate that look for the Broadkaster, it’s done a fine job of it with this Bourbon Stain. Ditto the flamed maple, which isn’t confined to the front and the headstock. It’s equally vivid on the back and sides, and the combination of the stain and the gloss finish makes this one the most eye-catching modern Gretsch designs we’ve seen. There’s multi-layer body binding front and back, with single-layer binding around the f-holes, headstock and ebony fingerboard. Aged pearloid thumbnail markers are the appropriate choice for humbucker-loaded Gretsches and, like the finish, the overall quality is top notch. 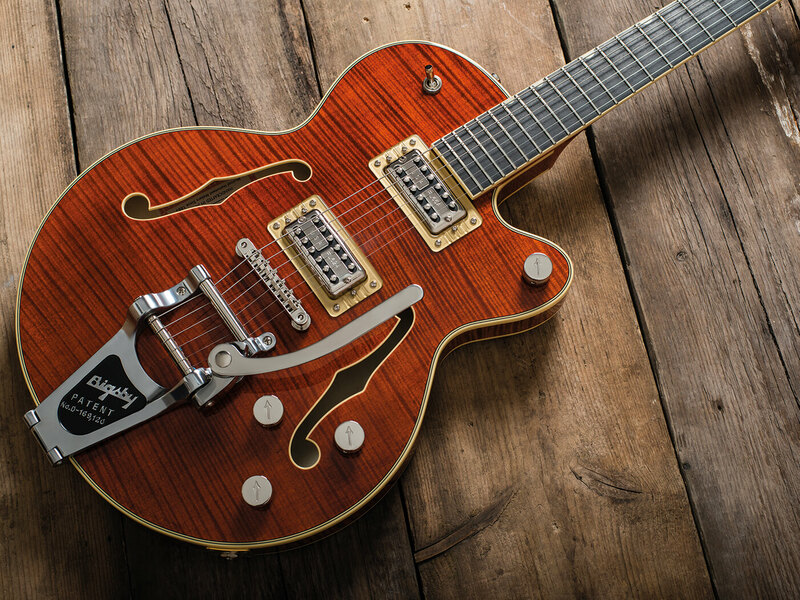 As much as we love vintage Gretsches, Terada’s construction standards are higher than Brooklyn’s ever were and you get the Gretsch charm without the quirks – or indeed the occasional comedy. Having said that, of late we have noticed that Bigsby arms are getting rather sharp around the edges, and the one on this guitar is a case in point. Under adrenaline-fuelled gigging conditions, it could prove hazardous. And although they’re all properly seated and there are no playability issues, we think the fret ends should be better dressed on a guitar of this value. The centre-block is wide as well as long, but despite leaving little room inside the body, the Broadkaster has a fabulously resonant unplugged tone. It sounds like the guitar is much bigger than it actually is, because the response is so deep and full, but it also has a natural chime and clarity, along with serious sustain. The pickups are exactly as described and they couldn’t be mistaken for anything other than Filter’Tron variants. They’re hotter and brighter than vintage Filter’Trons, but it’s as if Tim Shaw has found a way to turn up the metaphorical volume rather than undertake a re-voicing. The bridge combines chime with a quacky growl and more than a modicum of twang. The neck provides fine contrast, with a far sweeter and more rounded character. Frequency response is very even and there’s a more neutral and hi-fi quality. Again, though, the tone is bright and there’s no shortage of definition on the low strings. The Broadkaster Jr successfully covers traditional Gretsch ground, but also manages to cope with higher volume levels. It interacts equally well with amp and pedal overdrive, where the natural sustain and rich harmonics really come into their own. Our review guitar perhaps needs a little breaking in, because we find ourselves struggling with tuning stability and the tuners aren’t the smoothest. It’s a shame because otherwise, the setup is near perfect and the Broadkaster is so easy and addictive to play. In all other respects, the guitar as good as it looks and it’s a near perfect amalgam of classic and modern Gretsch appeal that’s easier to handle than its larger-bodied siblings. Great looks, fabulous tone and a beguiling blend of vintage and modern Gretsch.